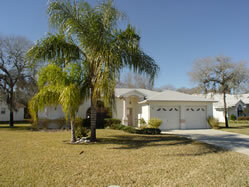 Great vacation home, a villa on golf course with private pool near to the gulf of Mexico in Florida for up to 6 persons. On the Fairway this three bedroomed, two bathroomed pool home hides in the trees. Attractive home with all the amenities. Solar heated pool. Formal and family sitting areas. Seperate formal dinning area. Large pool deck and good size pool. Over looking the fairway.